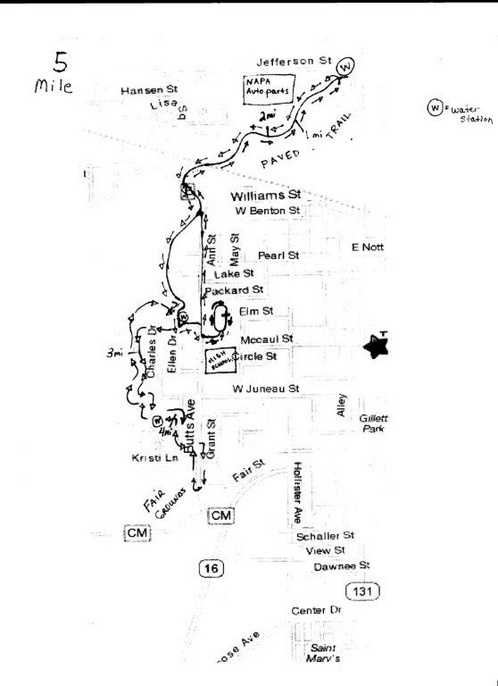 5 Mile course map - Remembering Jesse Parker, Inc. Begin at the Tomah High School Track, traveling out the south gate and turning north along Butts Ave. Continue north past Williams St to the Tomah Recreational Trail along the Lemonweir River turning around at Superior Ave, retracing the trail until crossing Butts Ave, then follow the trail along Lake Tomah behind Tomah Memorial Hospital to Lakeside Dr at Winnebago Park. Continue the city loop following course directions until also finishing at the Tomah High School Track.